Facebook's takeover of virtual reality firm Oculus appears to have won approval from anti-trust regulators in the United States, or at the very least successfully avoided opposition. The US. Department of Justice and Federal Trade Commission had been given 30 days to request more information about the deal, which puts the Oculus Rift in Facebook's hands, or register disapproval. Facebook had asked the FTC for early clearance, which was granted, meaning there likely won't be any more hurdles barring the imminent $2 billion (around £1.19bn, AU$2.1bn) takeover. For consumers, the news effectively kills any lingering hope of a Facebook-free Oculus Rift experience, whether they like it or not. The buyout has so far proved unpopular among the army of Kickstarter backers who kicked in $2.4 million (around £1.43m, AU$2.6m) to to help Oculus reach its funding goal. Some of them demanded their money back. The purchase received a mixed reaction from the gaming community. The creator of Minecraft has nixed a version of the game for the Rift, claiming he finds Facebook "creepy." 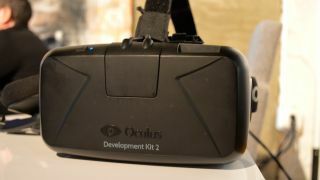 On the flip side, since the buyout, developers are flocking to pick up the second development kit, perhaps under the impression that Facebook's vast resources give Oculus a better shot at making the grade. Regardless of all that, there seems to be little to stop Facebook slapping its vision for the future of virtual reality all over Oculus and its promising headset.